Navigate the Cancer Maze in Conversation with Survivors Fran Drescher and Grace Gawler “Cancer Schmancer”! 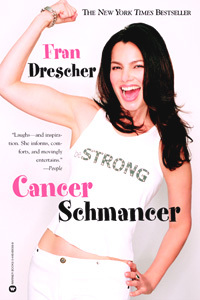 Cancer Schmancer is a name that one could easily associate with Fran Drescher; loved by millions for her television role as ‘The Nanny’, this humorous, elegant, beautiful, fun loving celebrity has a more serious side to her life and mission. Listen in to Voice America’s Health and Wellness Channel Friday 26 October 12 noon PST USA on Grace Gawler’s Navigating the Cancer Maze to hear about Fran’s cancer journey and how her life adversity launched a new movement in cancer awareness. What connects Fran Drescher and Grace Gawler? Both women have experienced great life adversities. Both women are using their lives to help others through the course of early cancer diagnosis. A survivor of uterine cancer; Fran Drescher brings a new beacon of hope; a message to all women to trust their intuition when they ‘know’ that something is desperately wrong with their health when a health professional insists they are OK. This is Fran Drescher’s story and it can happen to any of us. Fran Dresher was misdiagnosed & mistreated for a peri-menopausal condition she did not have. Her doctors told her she was experiencing symptoms because of a long list of reasons – she was too young, too thin, and another reason given was that she ate too much spinach! Fran was prescribed hormones to treat the symptoms, but her doctors made one fundamental error – they did not order proper diagnostic tests. Fran says; at the time, I didn’t know to ask why or why not, because I was just happy to be told I was too young for any other condition! Eventually an endometrial biopsy confirmed Fran’s greatest fear; she had cancer. Using her own experience and new found awareness, Fran created not only the book of the same name, but the Cancer Schmancer Movement and Cancer Schmancer Foundation. The Movement aims to of help transform women from patients into medical consumers, and to shift priority from searching for a cancer cure towards prevention and early detection of cancer; a timely message to a nation where cancer diagnosis dominates lives, families and communities. In the U.S. 1 in 3 women and 1 in 2 men will be diagnosed with cancer in their lifetime. BUT THERE IS HOPE… Because when cancer is found early, 90% SURVIVE! Every woman, regardless of age, race or socioeconomic background deserves to have the opportunity of survival. Cancer Schmancer’s message inspired by Fran Dreschers experience is clear; by catching cancer early and by shifting focus from just searching for a cure to education, prevention and early detection, lives can be saved TODAY. By empowering ourselves and the women we love to become medical consumers; to listen to our bodies, ask the right questions of our doctors and seek second opinions, we can prevent cancer and, if we still end up with it, detect cancer in its earliest stages. Cancer Schmancer is perhaps one of the most innovative Cancer movements in the world with a new message that sheds light on a method that works to end mortality due to late stage diagnosis. And that’s EARLY DETECTION. Join us in saving lives. Recently Fran Drescher has begun helping children to become aware of how attitudes shape life through her delightful picture book called ‘Being Wendy’. Listen to Frans’ story, hear her talk about her books and more on…Navigating the Cancer Maze this Friday 26 October 12 noon PST on Voice America’s Health and Wellness Channel with Grace Gawler. Help us to get the message out about early detection and prevention – Please remember to like this on Facebook! Cancer survival – the Power of Story; the story of Zheng Cao’s recovery and control of her cancer. Treated for 24 metastatic brain tumours by cyberknife; she remains a testament to the effectiveness of modern medicine. Today I sat in my room at Hallwang Private Oncology Clinic, misty rain, autumn leaves, red squirrels playing in the tree branches – an idyllic place for cancer patients to begin a cancerrecovery experience. For some it will be the beginning of a long journey and for most who come here; hope is offered where there was none. The Hallwang Clinic accesses some of the best medical brains in Europe if not the world. Here in Germany large numbers of patients are treated due to population density therefore medical therapies have the opportunity to be extensively trialled – even the more important, rare cancers diagnosed in Australia are to be found here in far greater numbers – hence greater experience and therefore improved success in treatment outcomes. Now to the USA…. I shared this moving story of Opera Singer Zheng Cao with a client who came today for counselling. Diagnosed with Glioblastoma Multiforme Stage 4 – although the tumour was removed surgically – in Australia she was given a 6 month prognosis with no hope for wellbeing or life extension. In shock she withdrew from life. A small recurrence has been detected here in Germany. Today this patient became alive again through the Power of Story; the story of Zheng Cao’s recovery and control of her cancer. Treated for 24 metastatic brain tumours by cyberknife; Zheng Cao remains a testament to the effectiveness of modern medicine. My patient is also about to undergo the amazing cyberknife treatment here in Germany…seeing this video dispeled her fear and helped restore her passion to live again and to heal. I am sure that you too will be inspired. Select the link below to see how modern medicine and love saved a life! Enjoy! Fran Drescher on my Voice America Radio Show comimg Soon…. It is not often I would choose to place testimonials as the key headings for my blog – however for my special internet radio show guest Dr Emmett Miller the calibre of the comments suggest why YOU might like to listen to this 50 minute interview. I have known Emmett since the early 90’s when we met in South Carolina for Health Professionals conferences. We immediately became friends and colleagues and we share a passion for music and movement. I was instrumental in his visits to Australia for lectures and workshops because I believe his work is second to none. We hope to invite him again in 2013 for our first Grace Gawler Institute Conference. We both believe in free resources for cancer patients and others who want to improve their lives and live to their full potential. The medium of internet radio gives million of people an opportunity to make life affirming changes. So this is the good news… my weekly Voice America internet radio show is free to air – a “digital encyclopaedia” for cancer patients that can be downloaded to an ipod or computer – based on my 38 years work in the field, the wisdom from long term cancer survivors and my books. Add in Emmett’s experience and you get access to 83 years experience!!! You can listen to samples of Emmett’s CDs on his website – but most importantly – listen in the show for expertise about how to use imagery in relation to cancer recovery. Emmett is the master of relaxation and imagery and he has been in the field for 45 years! The instruments of healing Dr. Miller offers are not scalpels and drugs, but words and experiences – images, memories, and emotions. Importantly, they do not substitute for or replace needed medical or psychological therapy-instead, they enable you to do your part in changing your diet, exercise, patterns, thoughts and relationships. Dr Emmett Miller ‘Navigating the Cancer Maze’ recorded Friday noon October 5 on Voice America’s Health and Wellness Channel – For Australian listeners the show is live 5 am Saturday mornings. Fortunately all shows are available afterwards as an MP3 download. They are archived and can be listened to and downloaded at any time. Best of all… the show is free to air! This first series forms a “digital encyclopaedia” for cancer patients that can be downloaded to an ipod or computer – based on my 38 years work in the field, the wisdom from long term cancer survivors and my books. Fran was diagnosed with early stage cancer of the uterus and is a survivor. As a result – she now champions her own US based charity: “Cancer Schmancer”. This is sure to be a fantastic interview. Listen in to Navigating the Cancer Maze on Voice America’s Health & Wellness Channel USA Pacific time 12 noon October 20 – Australian time 5 am 21 October. You can listen anytime. The show is recorded and available for download following each episode. More Soon…….